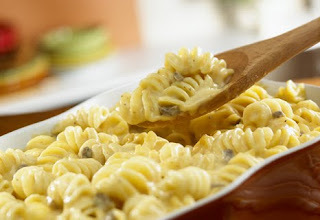 Stir the soup, cheeses, milk and black pepper in a 1 1/2-quart casserole. Stir in the pasta. Easy Substitution: Substitute 2 cups your favorite shredded cheese for the 2-cheese blend. Serving Suggestion: Serve with a Caesar salad. For dessert serve red grapes.